The chronicles of Phil’s road trip to the west coast finally come to an end with a visit to a hot dog chain known as Weinerschnitzel. This restaurant does not exist in my area, and I have never been to one. Here is Phil with the review. Phil: So it’s been over a month since I actually went on the West Coast Fast Food Road Trip and I am just now posting my review of Wienerschnitzel, the last stop of the trip. Yes, I procrastinate waaaaay too much. So with out further stalling, here’s the review. I was a little unsure about this one when I ordered it, but I’m sure glad I got it. I didn’t know how the chili would be at fast food joint, but it was actually pretty good. In comparison to a famous Baltimore place know for its chili dogs, G&A Restaurant (Guy Fieri went there for Diners, Drive-Ins, and Dives!!!!!!!! ), Wienerschnitzel was actually better. Like, a lot better (I guess that’s a review for another day). The chili wasn’t runny, had no beans, it had a nice kick/ flavor to it, and it complemented the hot dog. The cheese on top was of the shredded cheddar variety and was a nice accent to the dog. This was tasty and worked great for a little snack, if you’re really hungry you might need a couple other dogs to fill you up. The price wasn’t too bad at a couple bucks and some change. This was just a plain ol’ hot dog with mustard on it. The bun did its job and wasn’t stale, so I was happy with it. The hot dog was decent, cheap and made for the perfect snack before going on a studio tour. A few of these will definitely hit the spot any time your stomach is growling. That’s right I had all three varieties of Limeades. I wasn’t man enough for the beer, but BOOM all three limeades. Top that. The strawberry was the best one, it was the most refreshing and the strawberry-lime flavoring just tasted great. If Wienerschnitzel were in Maryland I would get one of these once a week. The cherry was good and still refreshing, but the cherry syrup was too strong and took over the whole drink. Unless you love strong artificial cherry flavor, you might want to pass on it. Then there is the lime limeade, should be the best one right? Nope, the lime flavoring was just way too syrupy and it ruined the rest of the drink. The refreshing light lime drink I was hoping for actually turned out to be a bad mix of too much syrup and too little water. Maybe some booze would have made the drink better. Too bad they only sell beer at this Wienerschnitzel. 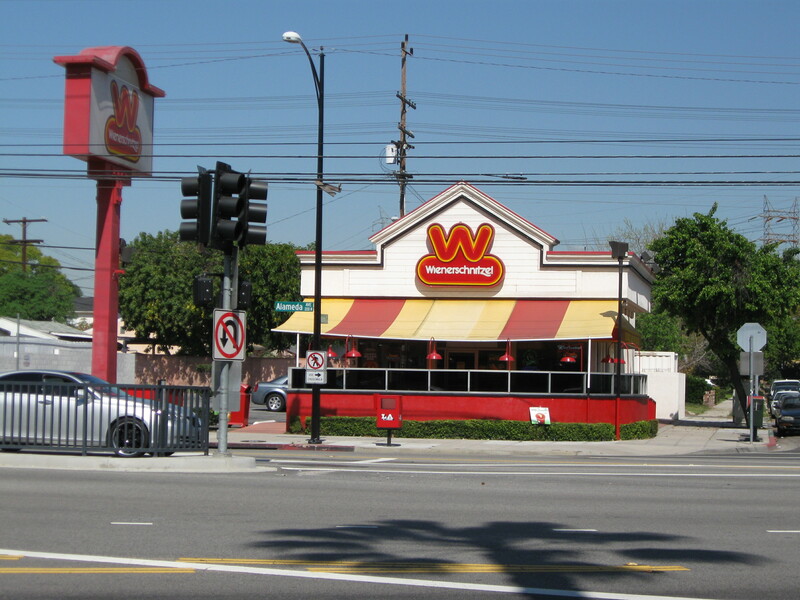 Overall, Wienerschnitzel was a good fast food place that had a big menu full of interesting choices. I was only able to try a few items, but the corn dogs, burgers, turkey dogs, Polish sandwich, Italian sausage, and angus dogs are items I have to try next time. Wienerschnitzel definitely lives up to its slogan of being DERlicious, so give it a try if you see one. Basically people on the west coast have a lot more fast food options than we do in Maryland. I’m jealous, but what are you going to do. Good thing the weather is nice out there and people can get out and work off those calories. This is the second hot dog review posted on JCR! What is your favorite hot dog chain? Post a comment! I really like their pastrami burger. It’s Der-licious!!! Stuggy’s in Fell’s Point has great hot dogs! Gotta review that place, man!